“Losing my hair affected me most. It was my favourite thing about me.”Anya, Hair Solved Client. 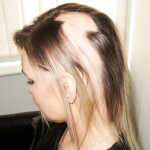 Hair loss is one of the most well-known side effects of chemotherapy and cancer treatment. At Hair Solved Belfast we understand how upsetting some women can find losing their hair, on top of everything else they are going through. If you have experienced, or are worried about losing your hair as a result of cancer treatment, we are here to help.